Antonio Villas-Boas/Business InsiderMicrosoft’s Surface Pro 6. For existing Surface Pro aficionados, there isn’t much here to tell you about. There’s a new matte black colour option that looks great but will cost you a little extra. The most exciting update is the enticing performance bump that comes from Intel’s eighth-generation Core i5 and Core i7 chips, which come with more cores than previous models. 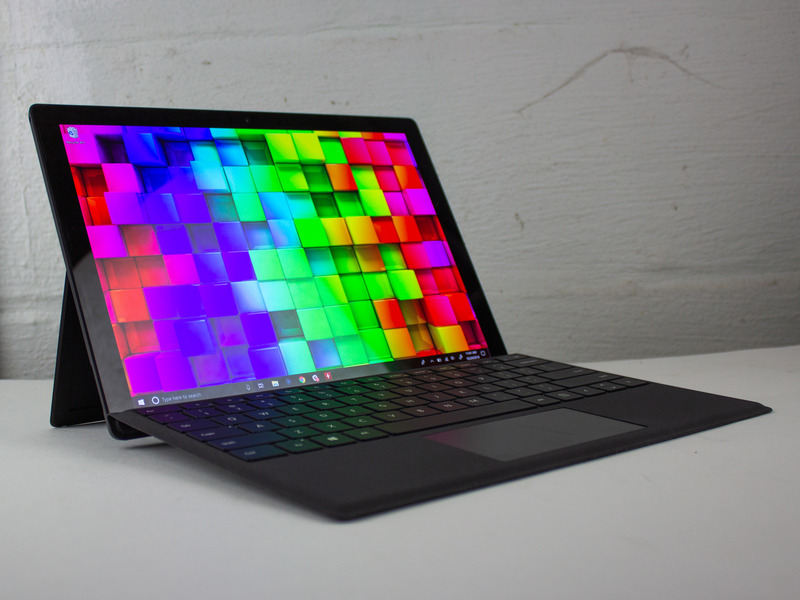 For those new to the Surface Pro or laptop/tablet hybrids with detachable keyboards, you’re getting a proven formula of light weight and the option of a tablet, all in a device that doesn’t compromise too much of a traditional laptop design. But the Surface Pro 6 is missing something that could affect you now or later, and it’s a major deal breaker in my books: There’s no USB-C or Thunderbolt 3 port. 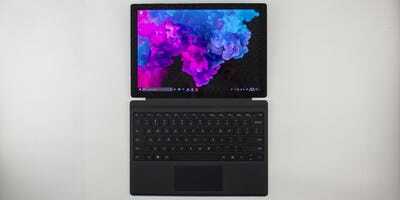 The Surface Pro 6 will feel familiar to existing Surface Pro users, and it’s a slight adjustment for regular laptop users. Surface Pro users will find the Surface Pro 6 completely familiar with its design, kickstand, and the Type Cover keyboard that flexes when it’s on your lap. For regular laptop users, it will be a slight adjustment. Instead of adjusting the display’s angle on a hinge, you’ll be adjusting the kickstand’s angle on a table or your lap. It’s not uncomfortable, but, despite its portability, it does require more space wherever you lay it down because the kickstand needs to extend outwards for wider viewing angles. That might be a problem in tight spaces, like a small desk or an economy plane seat with a small tray, where you might not be able to extend the kickstand very far. But I haven’t yet faced any problems with that. 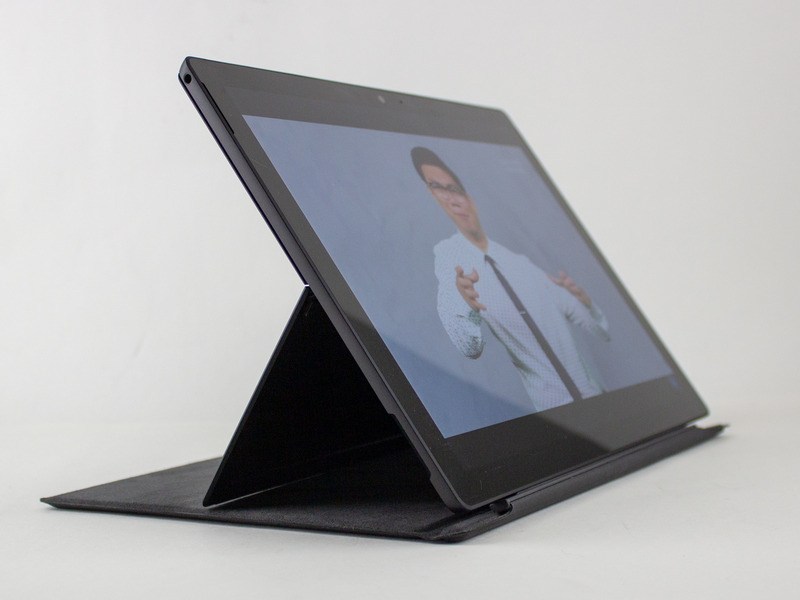 But the kickstand design does give you great versatility in viewing angles in general. 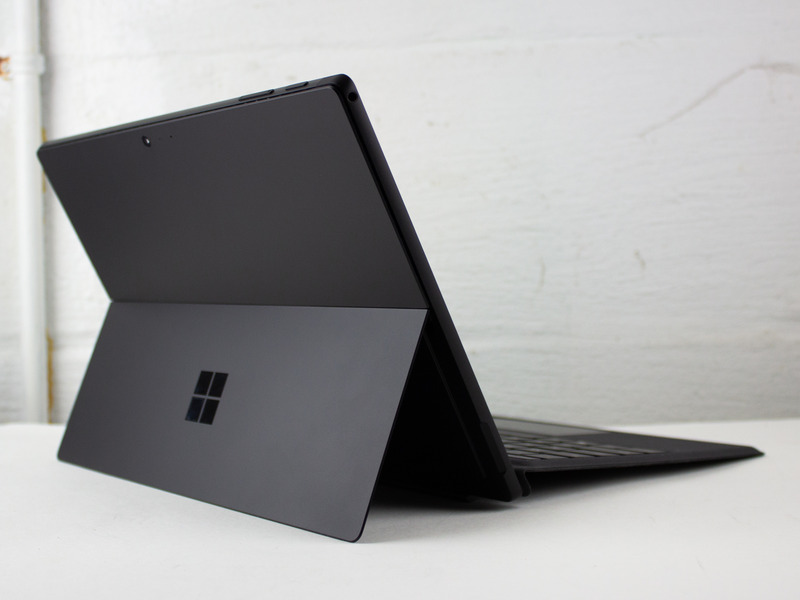 You can angle the display almost flat against a surface, or completely flat with the kickstand tucked in flush against the Surface Pro 6. Using the Type Cover as a platform or removing it altogether is great for using the device like a tablet. One of the main draws of getting a Surface Pro tablet/laptop hybrid is that you can, indeed, use it like a tablet. I have to say, as new Surface Pro user, it’s been pretty great to use the Type Cover as a platform or set it aside altogether at times, like when I’m getting comfortable for a long YouTube video. 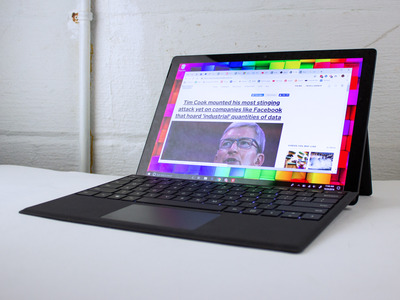 Let’s just say I get the allure of a hybrid like the Surface Pro 6, especially when there’s so little compromise in design and performance against a regular laptop design. The Surface Pro 6 handles everything I need it to do. Microsoft sent me the eighth-generation Core i5 Surface Pro 6 model with 8 GB of RAM, and it handily chews through my workflow, which mostly involves the Chrome web browser with up to 20 open tabs, the Slack office messaging app, and some light photo editing on Adobe Photoshop Elements. Using Intel’s eighth generation of chips is perhaps the biggest upgrade here, as you now get four cores versus the two that came with older generations of Intel’s laptop chips in older, pre-2018 laptops. Those extra cores make a difference by handling your daily workflow more comfortably, as well as any tasks that need a little more oomph. It also means the Surface Pro 6 could last longer, too. There’s also a Core i7 model with 16 GB of RAM available, which can likely handle more intensive tasks with smoother and faster performance. The 12.3-inch display is fantastic, but it could be slightly bigger. The Surface Pro 6’s display is bright, sharp, and makes whatever you’re looking at look fantastic. The 3:2 aspect ratio is great for reading articles or documents because it’s taller than the standard 16:9 aspect ratio. It’s a feature that’s been adopted on other laptop brands, too, and if you think about it, it makes a lot of sense: You’re mostly scrolling downwards when viewing content in apps, so a screen that’s taller than usual lets you see more. At 12.3 inches, the display is smaller than you’d find on most regular laptops, which typically have displays larger than 13.3 inches. I feel like Microsoft could have given the Surface Pro 6 a more standard, 13.3-inch screen without sacrificing the Surface Pro 6’s size. The bezel around the display is quite thick, and it’s a waste of potential screen space, if you ask me. If it’s a technical restriction, I’d understand – after all, you’re getting a full laptop in a tablet design. But I’m less inclined to accept a larger bezel for the sake of usability of the touchscreen or using the Surface Pro 6 in tablet mode. Smartphone makers have been able to design smartphones with ultra-thin bezels that are purely designed to be used in hands and with touch. The Type Cover offers a better typing experience than Apple’s latest MacBook laptops. The keyboard on the Type Covers available for the Surface Pro 6 is possibly the best laptop keyboard I’ve used. It’s incredibly comfortable to type on, and it has satisfying tactile feedback. Typing is a joy on this thing. The touchpad is also very good, among the best I’ve used on a Windows laptop. It’s a little small for my liking, and there seems to be a little extra space it could fill out. Still, I adjusted pretty quickly, and it hasn’t been a problem. The Type Cover does flex and bend more than a standard laptop keyboard, especially when I have the Surface Pro 6 on my lap. This can be an odd sensation, but has never posed a problem for me. 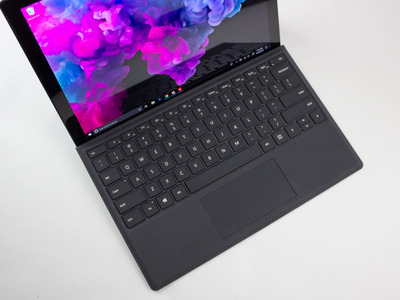 The biggest thing that’s holding back the Surface Pro 6: no USB-C.
Microsoft’s total dismissal of USB-C and the Thunderbolt 3 standard on the Surface Pro 6 is insanity at this stage, and I’ve written why here. It’s a 2018 machine with support for pre-2015 accessories, which is when USB-C/Thunderbolt 3 started appearing on mainstream devices. In a nutshell, it stops anyone from adopting superior USB-C/Thunderbolt 3 accessories – like external hard drives – for their entire ownership of the Surface Pro 6, which could be years. You also can’t use USB-C/Thunderbolt 3 for docking stations, which let you plug in all your external devices and accessories, including a laptop’s charger, into a single port. Microsoft has its own solution with the pricey $US200 Surface Dock, but it uses the company’s proprietary Surface Connector and it doesn’t support USB-C/Thunderbolt 3 devices, either. 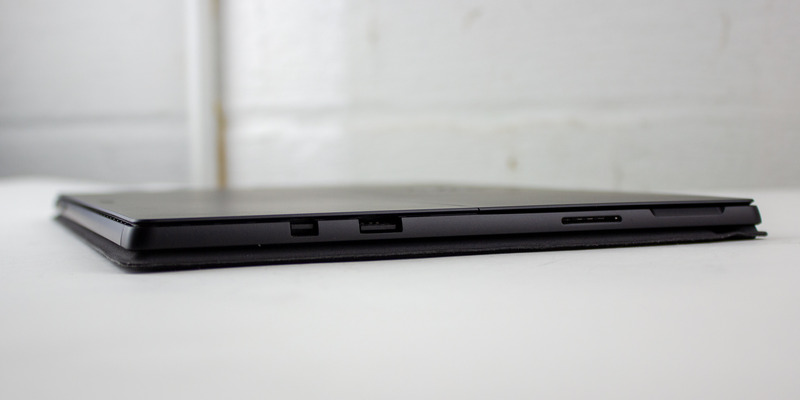 It’s also a hugely limiting factor for anyone who has already adopted USB-C/Thunderbolt 3 accessories and plans to use the Surface Pro 6 as their primary device. If you do have a computer that supports USB-C/Thunderbolt 3, the Surface Pro 6 is a secondary device at best. In my case, it’s true that all my current accessories plug into the Surface Pro 6 or a Surface Dock without issue, as I haven’t adopted USB-C/Thunderbolt 3 devices. But what if I (and you) wanted to dive into USB-C/Thunderbolt 3 in a year or so? What if I need to buy a new device that’s available with USB-C/Thunderbolt 3? I’d be limited in buying the older models that support regular USB-A, which use slower standards. Not exactly the cutting edge of tech. To boot, the Surface Pro 6’s single regular USB-A port, as well as the multiple USB ports on the Surface Dock, only support USB 3.0, not USB 3.1, which is twice as fast. It’s not likely to affect casual user needs too much, but any professional won’t find the support they’re looking for, at least in a brand-new device in 2018. To be clear, I don’t support Apple’s aggressive move to all-USB-C laptops, either. It’s too much of a shock, and it’s a bet that doesn’t seem to be panning out for Apple. 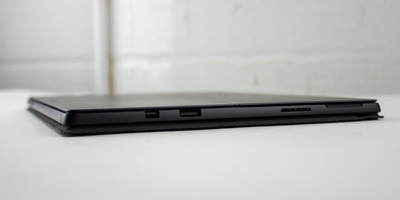 I was able to hook up my camera to transfer the photos in this review directly to the Surface Pro 6 without an adaptor, whereas I need a USB-C dongle to connect my camera to my 2016 all-USB-C MacBook Pro. The Surface Pro 6 costs $US900, which is almost a bargain. Except, it doesn’t really cost $US900. The Surface Pro 6 has an enticing sub-$US1,000 price at $US900, but the Type Cover keyboard comes as an “optional” extra accessory. Of course, the keyboard isn’t really an option: You have to get it if you want to use the Surface Pro 6 as a laptop. So that means you can add an extra $US130 minimum to the Surface Pro 6’s price tag. Microsoft’s reasoning behind this is to let buyers chose which Type Cover they want, of which there are various models with different features, like a fingerprint scanner or felt-like Alcantara finishes. It makes sense, to a degree, but I wouldn’t be surprised if buyers had bought a Surface Pro in the past without the keyboard, fully expecting it to come with a keyboard. Laptops just …come with keyboards, right? 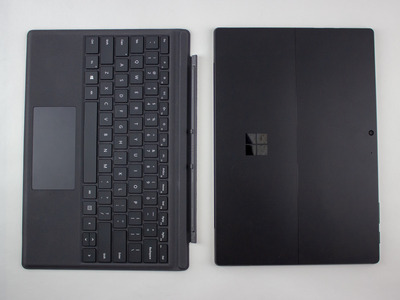 Promoting the Surface Pro 6 as a sub-$US1,000 laptop when it requires you to buy a keyboard separately just doesn’t sit right with me. 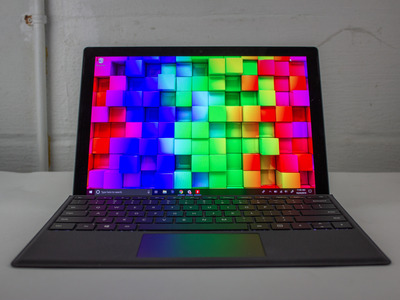 Still, at $US1,030, the Surface Pro 6 and Type Cover combo is a great deal, even if it leaves a sour taste in my mouth that Microsoft is selling you a keyboard as an extra accessory. Should you buy the Surface Pro 6? If the Surface Pro 6 had USB-C/Thunderbolt 3, it would be an easier recommendation. Even if you’re not really interested in adopting the latest tech standards, I’m still wary in recommending the Surface Pro 6. Being forcefully limited to older standards just doesn’t seem like the right way to go when you’re buying a new device in 2018, where USB-C and Thunderbolt 3 are very much present. Microsoft’s Surface Pro 6 also looks less enticing when there are other hybrids on the market that come with USB-C/Thunderbolt 3, like HP’s latest X360 13T, which also comes with some of the regular ports you’re used to. The X360 also has similar specs as the Surface Pro 6. To sum it all up: Unfortunately, I do not recommend the Surface Pro 6, and it’s all because of the lack of USB-C/Thunderbolt 3. If you truly, truly don’t care, then sure, the Surface Pro 6 is a great, capable machine. Just don’t complain if you ever want to get a USB-C/Thunderbolt 3 accessory down the line.